INTACS are a non-laser treatment approved by the FDA to correct mild nearsightedness. The FDA recognizes Intacs as a compassionate use device for the treatment of keratoconus. 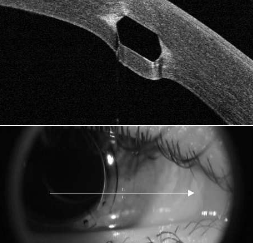 Intacs are small disks implanted into the peripheral cornea in order to increase the volume in the periphery, and flatten the central cornea. INTACS are a great alternative treatment to corneal transplants for some keratoconous patients, and their effectiveness can be measured in a matter of weeks. Click here For Intacs patient booklet. The intacs procedure is an outpatient procedure lasting between 15-30 minutes. Our surgeons use an all-laser technique using an intralase laser in order to make precise passes in the peripheral cornea. The surgeon will then place a custom-fitted intacs segments to reduce the steepness of the cornea based on the degree of keratoconus. The patient may return home immediately after surgery. Antibiotic drops will be prescribed by the surgeon, and should be administered 4 times a day the first week, and tapered off the week following surgery. Side effects and complications are much less common in the INTACS procedure than in corneal transplants because they are far less invasive. Rare cases of serious side effects include infection, extrusion of the INTACS segments or vision loss. Less serious potential side effects include minor deposits in the cornea, lid drop, and visual disturbances. In rare cases, if necessary, INTACS segments can be removed or replaced by your surgeon. Additional visits may be needed based on the discretion of your surgeon. After 1 or 2 months, the cornea is generally stable enough to fit contact lenses or glasses. However, it may take up to one year for the patient's prescription to stabilize; therefore, more follow-up visits may be necessary. The patient may resume most activities immediately after surgery; however, it is important to be very careful with the eye, follow your doctor's directions carefully, and to wear protective eye-wear during the first week following surgery. Most patients can return to work after 1-3 days, although their vision in the operated eye may be limited until they have had more time to heal. Well over 95% of patients have significant improvement, up to 20/20 visual acuity, after INTACS surgery. However, the success of the procedure depends on the underlying degree of keratoconus, and the rate of recovery can range anywhere from 1 to 6 months. Q1: What are INTACS prescription inserts? A1: INTACS are intrastromal corneal ring segments (ICRS) designed to reshape the curvature of the cornea. They are approved for mild myopia and for stabilization of Keratoconus. They are thin, clear, crescent shape, prescription inserts that are placed into the periphery of the cornea by an ophthalmologist in a quick outpatient or in office procedure. They come in a variety of sizes based on the prescription and/or condition being treated. Q2: Are ICRS approved by the Food and Drug Administration (FDA)? A2: Yes. The original FDA approval on April 9,1999 was for treatment of mild myopia. In July 2004, the FDA issued a Humanitarian Device Exemption (HDE) for use of ICRS to treat keratoconus in those who cannot achieve adequate vision with contact lenses or glasses, so that stable, functional vision may be restored and the need for a corneal transplant procedure may be deferred. Q3: Why use ICRS to treat Keratoconus? A3: Surgical treatment of keratoconus with ICRS is both reversible and less invasive than penetrating keratoplasty (PK). Recovery time is faster, the cost is significantly lower than transplant procedures. Patients may even wear contact lenses again if required. ICRS do not preclude PK at a later time should that become necessary. Long term results with ICRS have been positive; they show topographic and refractive stability as well as an increased tolerance for contact lens wear.